Two of my favorite things are knitting and reading, and the evidence of this often shows up in my photographs. I love seeing what other people are knitting and reading as well. So, what are you knitting or crocheting right now? What are you reading? 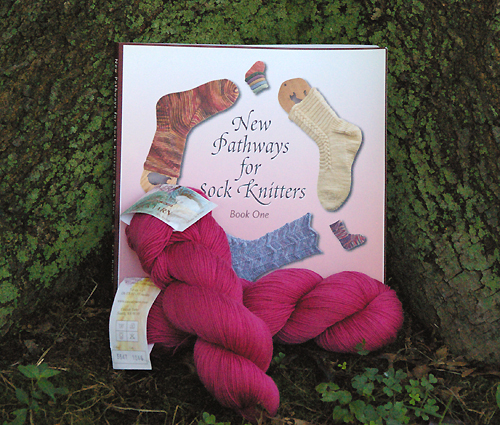 I got back to my skills building promise to myself and began re-reading Cat Bordhi’s New Pathways for Sock Knitters, Book One, this week. I love this book. The illustrations and designs are all wonderful. I have no frame of comparison, but if this is sock knitting – I’m in love. I made my first official socks a ways back, my Buttercup Socks, the Little Sky “learning sock”, a top down sock, from this book. I also mastered “Judy’s magic cast on” this week. What a revelation. I can totally see using it for more than just socks. It really goes quickly once you get the hang of it, and is truly, totally, invisible!! I’m super excited now to break out the hot pink sock yarn and make some “Mommy and Me” socks for Lil One and I. I’m going to attempt the “Emma” sock for Lil One, and then go back to the book for “Veil of Leaves” for myself. So, whilst I concentrate on learning sock knitting, and cannot share my current projects yet (super secret gift knitting), let me share one of my FO for the past week. The little Berry Breiwick Beret turned out beautifully, but not so little. She seems to like it, but if I pop it straight on her head, she can’t see. 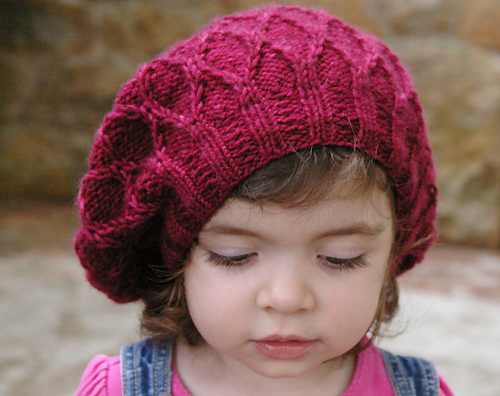 For now, she’ll have to wear it slouchy “baby bohemian” style. She seemed to like to play with it, and despite the heat, I did get her to try it on for a few cute pics. She’s just so, stinkin’, cute – even if I do say so myself! Have a great week everyone! That is such a great book – love the instructional diagrams!! And Cat herself is plain awesome (I met her at the retreat I went to back in November). 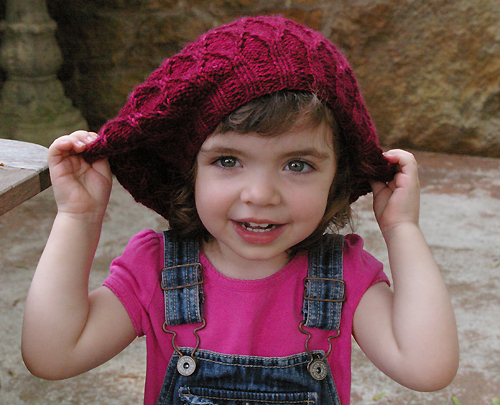 That hat is lovely – what a great color for the lil’one! 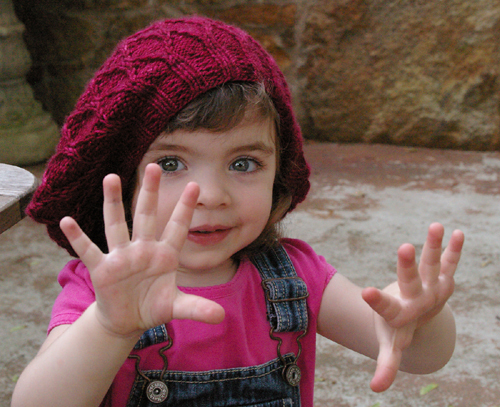 The beret and the yarn color are wonderful! and the little model is stunning! she is stinkin; cute. i want to try socks next too, i will check the library for this one! p.s. i love that hat. maybe i will need to skip the socks and make a slouchy hat instead! That hat is adorable! Good luck with the socks. You’re completely right. Too cute for words! That color is perfect for her.